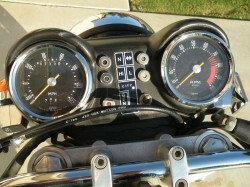 Up on eBay this week is a very nice Ducati 860 GT dressed in sinister, black paint. 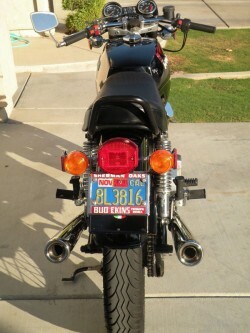 When new, the styling was considered very controversial and the bike did not sell as well as hoped. It was penned by Giorgetto Giugiaro, famous designer of some of the most beautiful and iconic cars of all time, from exotics like the original Lotus Esprit, Maserati Ghibli, DeTomaso Mangusta, to functional, everyday workhorses like the VW Golf/Rabbit. Have I mentioned how much I’m going to miss the trellis frame when the new Ducati superbike comes out? In any event, this was intended to be a bread-and-butter model for Ducati and, controversial styling notwithstanding, they made quite a few of these. The looks may be an acquired taste, but under the skin beats the classic Ducati v-twin, thumping out 65hp from its 864cc’s. 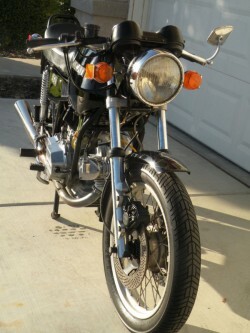 This can make the 860 GT the perfect, affordable entry to bevel-drive Ducati ownership. 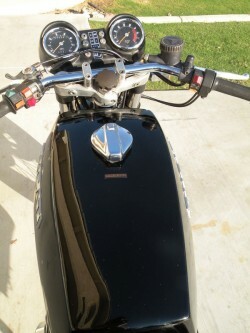 Overall, the bike is in well-used but well-maintained and thoughtfully modified condition and appears to have some updates, including the double-disk braked front-end the owner believes was a later addition and the engine has been thoroughly gone-through. Late last fall when I was taking a ride through some country roads, the bike started to lose power. Turns out it lost compression on the vertical cylinder. Upon removal of the both cylinders, I coudn’t find any reason for the compression loss. 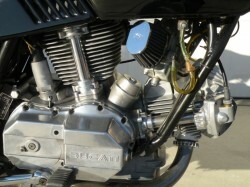 As a result, both cyinders were honed about 20 thousandths to accept brand new 86.6mm pistons, rings, pins and clips. 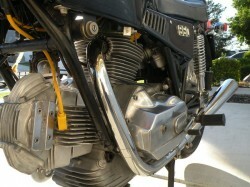 New valves were cut and lapped in, seals, guides and springs were also installed at the time. Both heads and barrels were glass blasted prior to machining. The crank and rods were checked for any play during disassembly. No play of any sort was detected. All of this work has only been completed within the last 30-50 miles. I ran a 30 wt. break-oil in it for those miles. It now has 50 wt. and a brand new oil filter. With a starting bid of $6,000.00, this could be one to watch. If the price doesn’t go too high it could be the perfect starter bevel-bike. 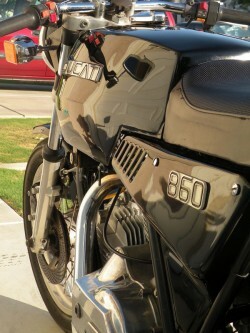 As an owner and fan of all things Ducati, read Mick Walker’s Ducati book before purchase of an 860 Duc. Just saying…. 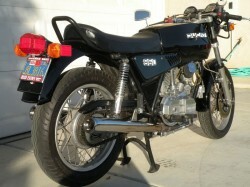 Previous story Brand New: 1979 Yamaha RD 400 Daytona Special with 1 mile!